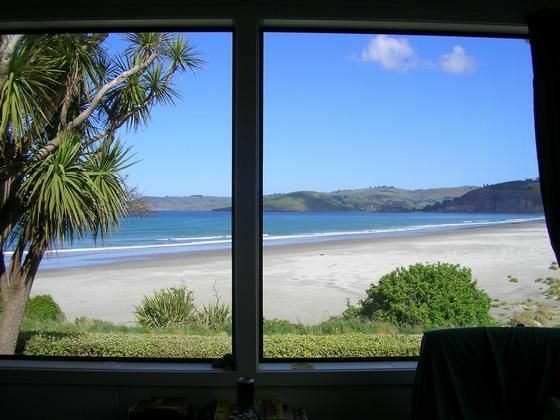 Only 15 minutes from the centre of Dunedin this family crib has easy access to a patrolled surf beach and is ideally situated for a great holiday. From the lounge you can watch the surfers and hectors dolphins play in the waves and see the ships going through Tairoa Heads. Enjoy the village atmosphere while taking advantage of all that Otago has to offer. From Warrington take the scenic coastal route to Karitane where you can take a fishing trip, hire kayaks or buy great brie at Evansdale Cheese. Venture further north to Moeraki or allow an hour to drive to Oamaru and visit the historic precinct. Go south from Warrington and visit the newly opened Orokanui Sanctuary, explore the Otago Peninsula and the albatross colony, visit the arts and crafts of Port Chalmers, take a trip on the Tairi Gorge railway or just enjoy Dunedin city. When you get back to Warrington sit on the porch, relax and watch the evening light on the water while the children wander down to the playground. First nights rental on booking and the balance to be paid two weeks prior to arrival. Bath towels are provided, we ask that you bring your own beach towels. Tariff is for 2 guests only - additional guests $15 per night. Beautiful location. House is nice and simple. Could do with improved second double bed (back of house bedroom). Not suitable for 2. Maybe technically but try actually sleeping in it. Mattress really needs replacing. The best kiwi Bach experience! Fantastic weather, very comfortable & well equipped place. 16 minutes to Dunedin. Very happy the family share their family Bach - it’s greatly appreciated, our family loved it, we’ll be back. The only thing we would have changed was the weather!